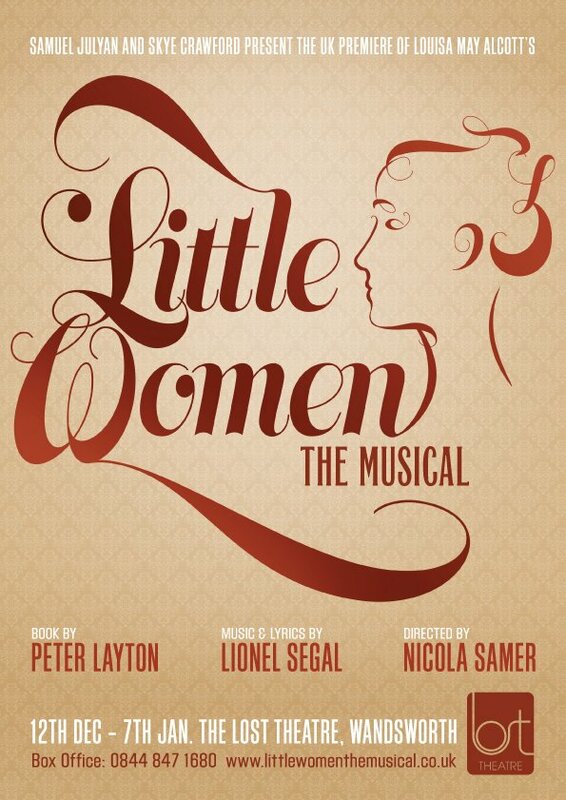 With music and lyrics by Lionel Segal and book by Peter Layton, this version of Little Women The Musical bears no relation to the production that ran for a short while on Broadway and has only been seen before in a one night concert showcase in 2005, making this the UK premiere run at the LOST theatre in Wandsworth. The musical is based on Louisa May Alcott’s well-loved 1868 novel, following the fortunes of the four March sisters in New England during Civil War-time as family responsibilities are cast against personal ambition and lives and loves pass by as poverty and social change loom large. Whereas Layton book remains largely faithful to the novel, it’s not a story that one would assume immediately lends itself to the musical treatment. Segal’s music does not overtly embrace the music of the time as far as I could perceive, but rather goes for a modern-sounding aesthetic which is extremely successful in parts and less so in others. Where the show is at its strongest is in elucidating the sisterly dynamic between the March girls and their songs together illuminate this perfectly, a real sense of familial bond emerging from their playful vitality and gorgeous harmonising. Charlotte Newton John’s characterful Jo leads the show extremely well, with sensitive support from Claire Chambers and Laura Hope London as Beth and Meg respectively and a sprightly turn from Caroline Rodgers as the young brattish Amy, who delivers her malapropisms perhaps a little too knowingly. But the play isn’t about the sisters alone and this is where the show falls down as it just doesn’t have a distinct enough voice, musically or dramatically. The various suitors to the sisters are all saddled with rather anodyne musical declarations of love reflecting their rather bland characters, only Glenn Lloyd’s Seamus managed to inject sufficient personality to stand out. Myra Sands’ cantankerous Aunt March and Jane Quinn’s meddling neighbour both provide good comic support but are never allowed to become more than caricatures. And even Nicola Delaney’s Marmee feels marginalised, her getting the final spotlight seems at odds with the show we’ve just seen. And because the story is so familiar to so many of us, the direction alongside it also feels a little too reverential, predictable even in how much of the show plays out. When surprises come, they feel misjudged, as in the dream sequence which allows a show-stopping Broadway number to be shoehorned in (it is a catchy song though and has a great routine attached to it, complete with yellow stocking gag) or the main final number, ‘Everybody’s Gettin’ Married’ which with its chirpiness, rams home the happy ending a little too forcefully. I also disliked the way in which several performers used singing voices which were hugely at odds with their character’s speaking voices, it was a real disconnect that undermined much of their dramatic work. Nicola Samer’s production does look good with set and costumes feeling appropriate and sounding right under Sarah Latto’s musical direction. And in terms of what it offers, it does exactly what it says on the tin, a musical version of Little Women. I just craved something more, either more musically complex, perhaps weaving in Civil War musical influences or continuing the harmonic progressions of the sisters, or dramatically, in really exploring the story and trying to reveal some new facet or dimension to make it stand out. As it is, it makes for solid entertainment that is rarely boring, it just could do with a little more inspiration.